Founder of the detective genre and author of works on cryptography, Edgar Allan Poe possessed what Shawn Rosenheim called a “cryptographic imagination.” Not only was Poe’s work influenced by secret writing, it inspired future critics to search his texts for secret clues and that fostered new modes of reading. Poe’s acclaimed complexity owes as much to a long and sophisticated tradition of his interpretative reading as it does to the “undercurrent of meaning” ciphered in his texts. 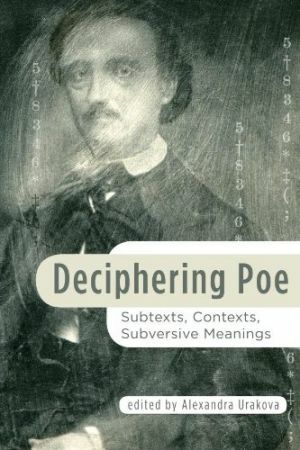 Grounded in previous scholarly work, Deciphering Poe: Contexts, Subtexts, Subversive Meanings explores the hoaxing and subversive nature of Poe’s art and expands this contextual framework. Contributors to the volume offer a highly nuanced picture of Poe’s engagement in the major discourses of the time – religious, philosophical, social, and literary. Twelve essays of the collection discuss Poe’s debt to baroque tradition, his response to Catholicism, his tribute to philosophical idea of sublimity, his complex response to racial issues, and his controversial afterlife reception. The volume includes new readings of Poe’s texts explicitly using codes, secret writing or techniques of detection – “The Gold Bug,” The Narrative of Arthur Gordon Pym, and the Dupin tales. The essays in the collection were originally presented as talks at the Poe Studies Association’s Third International Edgar Allan Poe Conference: The Bicentennial in October 2009. The contributors are Poe scholars from the United States, France, Germany, and Canada: Amy C. Branam, Lauren Curtright, Daniel Fineman, William E. Engel, John C. Havard, Henri Justin, John Edward Martin, Sean Moreland, Philip E. Phillips, Stephanie Sommerfeld, and Timothy N. Towslee.